Author adminPosted on August 24, 2018 August 24, 2018 Categories ReviewsLeave a comment on More Squirmish Reviews! 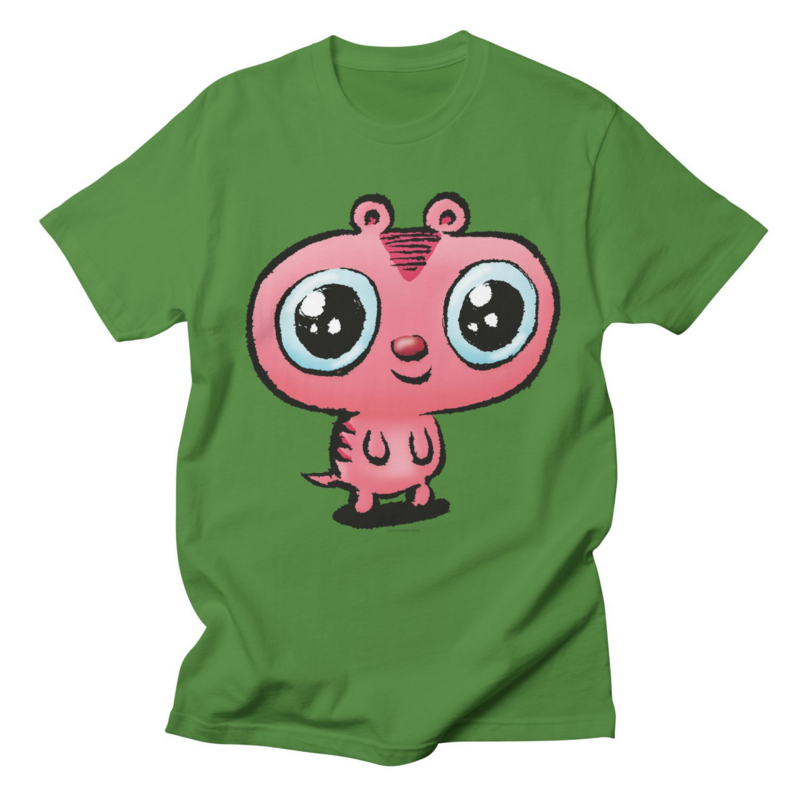 You Can Now Get ALL the Current Squirmish Characters as T-Shirts! Author adminPosted on August 24, 2018 Categories NewsLeave a comment on You Can Now Get ALL the Current Squirmish Characters as T-Shirts! They are giving away a copy of the game as well… you can find out how to enter here. You can buy Squirmish online here. Squirmish Contest! Win one of five copies of the new Gamewright edition! Author adminPosted on June 15, 2018 Categories Contests, NewsLeave a comment on Squirmish Contest! Win one of five copies of the new Gamewright edition! 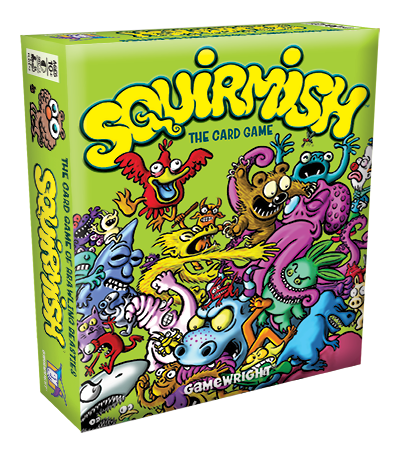 Squirmish from Gamewright in Stores Now! Read the latest review! The new edition of Squirmish from Gamewright is in stores now! It has many improvements over the old edition… including the frequently-requested improvement of square cards! Other improvements include increased game speed, a revised order of play, new card-back art, and googly-eye hit counters! You can see the updated rules here. You can order directly from Gamewright here, and also see what local stores in your area have ordered copies. You can order off of Amazon here (where you can also leave a review if you want to really help us out). Author adminPosted on June 6, 2018 Categories News, Reviews, SQUIRMISHLeave a comment on Squirmish from Gamewright in Stores Now! Read the latest review! 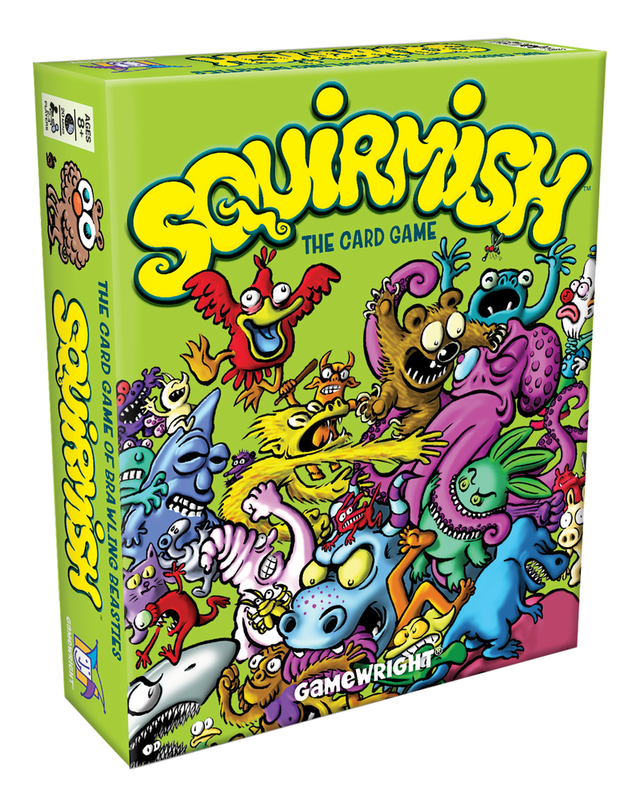 SQUIRMISH is now available for pre-order from Gamewright! You can now pre-order Squirmish in the Gamewright shop online. Author adminPosted on April 10, 2018 June 6, 2018 Categories NewsLeave a comment on SQUIRMISH is now available for pre-order from Gamewright! Squirmish, the card game of brawling beasties, will be making it’s debut this week at the New York Toy Fair as the newest addition to Gamewright‘s excellent library of games! 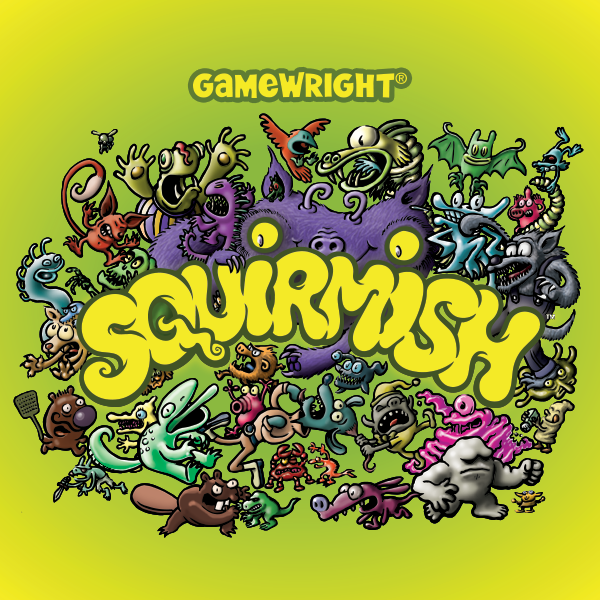 I had contacted Gamewright last year in hopes that they may want to license Squirmish. Gamewright was my first pick for a publisher for Squirmish, as my daughters and I love many of their games (I recommend Sushi Go! Party, Forbidden Island and Rat-A-Tat Cat, to name a few), all of their games are aimed at the same demographic (casual games that are equally fun for kids and adults), and they have great distribution (the Target up the street from us generally has over half a dozen of their games in stock). To my delight, they were enthusiastic about the prospect of publishing Squirmish… so very soon, Squirmish will be reaching a much wider audience. 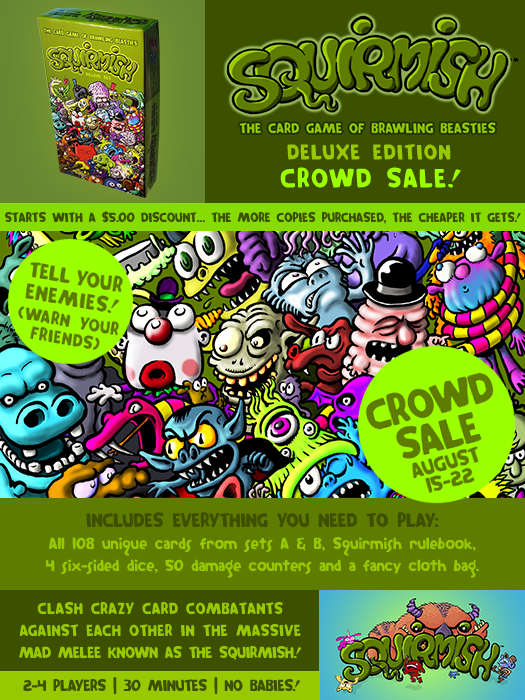 The artwork for the new Squirmish card back (yes, the cards are square!). The card back is available as a t-shirt by clicking on the image. In collaboration with Gamewright, a number of improvements have been made to the game (like the often-requested square cards… and new googly-eye damage counters!). You can check out the updated Squirmish 2.0 rules here. Watch for it soon at a store near you! Squirmish has been recieved a few more reviews in recent weeks. Check them out! “There is a ton of replay ability here… All of the boys, including Dad, are fans of Pokémon and Squirmish has provided a fresh and simple take on card battling games. The variety that is found within the game is really amazing.” – 8 0f 10 Stars at The Dice Have It. SQUIRMISH! The reviews are in… the best new game nowhere to be seen at Gencon 2016! Squirmish is on sale this week! Save $5 or more off the Deluxe Edition! The best new game nowhere to be seen at ‪#‎gencon‬ 2016! Don’t believe us? Check out the reviews! “Overall, I’ve had fun with Squirmish both with my kids and with adult players. I think it’s a lot of fun for families. The dice-based abilities mean that there’s still a good amount of chance involved, which gives less-experienced players a chance to take on more-experienced players, so gamers who want something with pure strategy may not like it quite as much. And don’t forget to shout your battle cries as you enter the fray!” – Jonathan H. Liu at Geekdad. “It’s a simple card game, but it has a lot of meat to it… If you’re looking for a battling card game that you can introduce to people to maybe even get them into bigger and deeper games, this is a great introduction to do so.” – David at Sit Down Standard. “It’s pretty straightforward and it’s quick to learn, but there’s a lot of different beasts and abilities.” – Alyssa at Sit Down Standard. “I get several requests for Kickstarter previews every week. Recently, I was sent a request for coverage for a game called Squirmish that was designed by a gentleman named Steven Stwalley. My heart sunk a little bit when I saw the words “card” and “combat” in his elevator pitch, but that all went away when I looked over the art assets he gave me. Squirmish’s art is juvenile, obnoxious, and maybe even a little gross. In other words? I loved it.” – Stephen Duetzmann at Engaged Family Gaming. “This game is made in direct response to collectible card games aimed at the pre-teen age group, such as Pokemon. There are battling monsters in this game, but unlike a collectible game, everything you need to play is included in one box. I’m a Pokemon Professor and Judge for the card game, so I was really very interested to try this out. It did not disappoint and actually exceeded expectations.” – Chandra Reyer at TSR’s Multiverse. “I don’t know what to say other than you might like it and maybe others won’t. I am one of those who like it. I don’t think it will replace Pokemon for me, but it is much easier to carry around around than all my Pokemon equipment! It is not cute. However , there are some cute Squirmish monsters. Cawfeather, Opossrat, Killgor the Conquerer, Cupcake, and a few more. I say anyone 2nd grade to 9th might like it. The Battle Cries are really funny! But don’t attempt to make a Donald Duck voice for Pompaduck. Oh, and be sure to add Googly eyes.  Heheheheheheheheh  (^._.^)/ Keep on Gaming! Meow!” – Chandra Reyer’s Daughter at TSR’s Multiverse. “It’s a really good game! I like the fighting.” – Ty (age 9) at Board Gaming at Home. “Ty’s age, absolutely brilliant game. If there’s one downside, it’s the sheer variety.” – Russell at Board Gaming at Home. “I like all the little characters that have been made up… they’re great fun.” – Kelly at Board Gaming at Home. Author adminPosted on August 18, 2016 December 22, 2016 Categories News, Reviews, SQUIRMISHLeave a comment on SQUIRMISH! The reviews are in… the best new game nowhere to be seen at Gencon 2016!